Saket is the mall capital of the city, with some of the best shopping malls of Delhi being nestled in the neighbourhood of Saket. One of the best place for luxury shopping in Delhi, the malls in Saket offer you the best of fashion trends worldwide. There is not a single brand which wouldn’t be available in the malls of Saket. Located near the Saket Metro station, lies the famous Select City Walk. 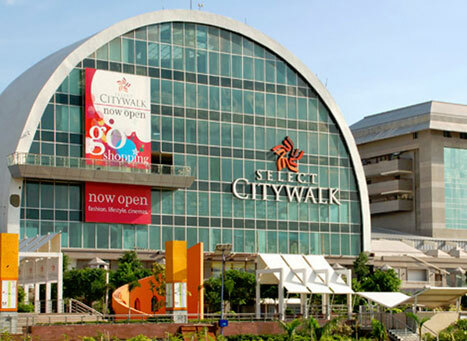 One of the most popular malls of Delhi, Select City Walk is a dream come true for every shopaholic. Ranging from all the major clothing brands to famous accessories shop and electronic outlets, Select City Walk has it all. Next to Select City Walk lies the DLF Place Saket and Southern Park Mall. Apart from these three, one of the famous malls in Delhi, MGF Metropolitan Mall attracts the major crowd during weekends. These malls combined together make up for one grand shopping destination in Delhi. These malls are famous for apparels shopping with store outlets of every major fashion brand being available in the complex. Brands like Zara and H&M, who have opened limited outlets in the city have made a major mark in either of these malls. Also, not just a shopping destination, Saket is also one of the best hangout places in the city. Saket offers some of the most famous restaurants, cafes and bars in Delhi. Although, the prices are slightly higher compared to other restaurants and cafes, the service, the ambience and lip-smacking food compensate for few extra bucks. Usually flooded by weekend party animals, the malls of Saket gives you the best experience of the luxurious weekend. Located in the plush colony of Saket, the mall attracts many career socialites, hanging out in the malls. The Cafes, Bistros and Bars in Select City Walk have gone onto resonate with those looking to have a good time with friends. Housing one of the few late-night bars and pubs in Delhi, Select City Walk serves as one of the many hotspots for nightlife in Delhi. Ideal for luxury shopping or hanging out and relaxing with your friends, Saket is the place to be on weekends. Saket metro station on Yellow Line of Delhi Metro is the nearest metro station to Saket. Saket is known for its upscale malls, catering to all the shopping needs. The numerous malls in and around Saket are some of the best malls in Delhi, where you can buy whatever you want. Ideal for luxury shopping, Saket malls also feature some of the best restaurants and Cafes in Delhi. Saket market opens up around 10 am and closes around 11 pm. The market remains open on all days.